The hodges are getting into the swing of things. Just got an email with these photos attached. It is their first colony after the training. This young colony is doing well. B.E.S.T. program is developing its second course. 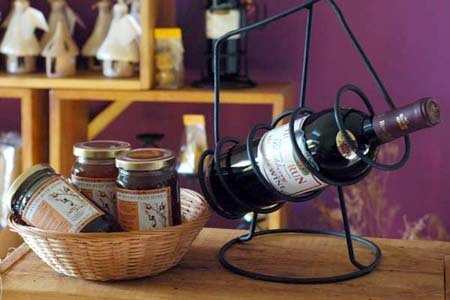 This course includes value adding such as candles making and propolis production. We are also in the process of developing another training centre nearer to Kampala City. It will be at Kajjansi, Entebbe Road. Once the model farm is established, this training centre will serve those who prefer to have their training done closer to Kampala. In fact the first batch of trainees had already started yesterday. Production of propolis is underway. For those who had not heard of “Propolis”, I had link the Wikipedia site here. 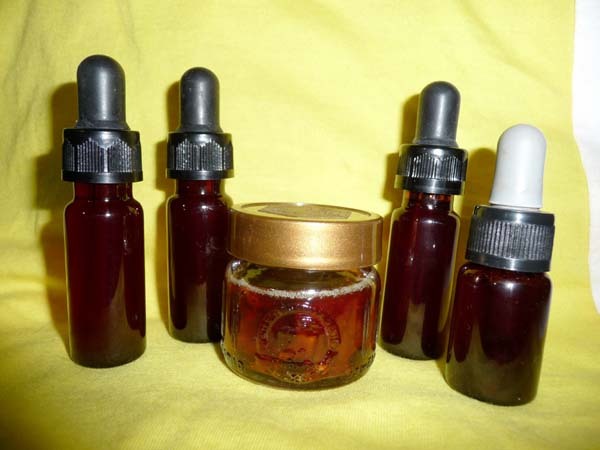 Production of propolis tinture and propolis paste under FAO guidelines. Ever wonder what actually happened when a honey bee stings you? The bee stinger is barbed. 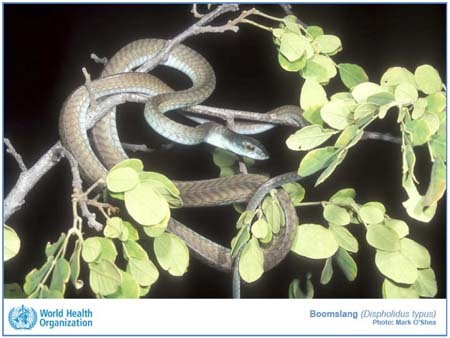 Just like a fishing hook, it will lodge its sting underneath your skin. 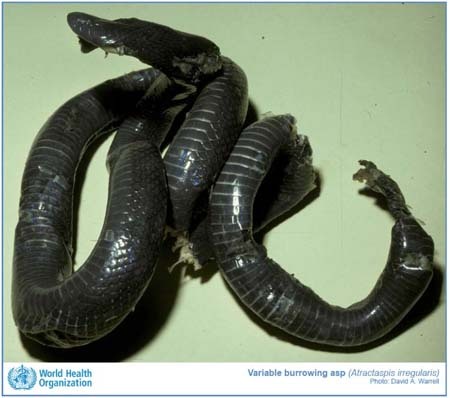 When she tried to get away from you, the whole venom segment of the body will tear away from her body, causing her instant death. 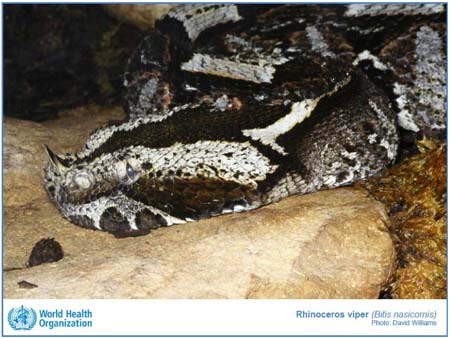 The venom sac muscles will continue to pump the venom into your body. Many researcher and scientist are using bee venom as an alternative to cure arthritis and tendonitis. 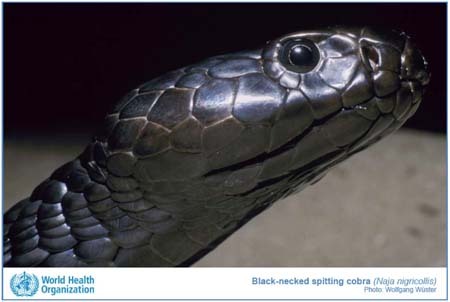 The venom is administered through injection or through bee sting. If the bee sting is used, the apitherapy practitioner will place bees on the skin, typically close to the joints, muscle or other body parts that are having problems. Somehow I am not in favour of this practice. It is destroying and killing the bees for the benefit of mankind. In order to relieve human suffering, the bees became the victims. Well this argument can be rebutted again in the name of science. Hopefully we can look into alternative cure. I would like to thank the bee which had sacrificed for mankind in order to gain this knowledge. I would also like to thank The Department of Entomology of Virginia Tech for sharing this valuable insight of honeybees. UN alarmed at huge decline in bee numbers……………………. GENEVA – THE UN on Thursday expressed alarm at a huge decline in bee colonies under a multiple onslaught of pests and pollution, urging an international effort to save the pollinators that are vital for food crops. Much of the decline, ranging up to 85 per cent in some areas, is taking place in the industrialised northern hemisphere due to more than a dozen factors, according to a report by the UN’s environmental agency. The fact is that of the 100 crop species that provide 90 per cent of the world’s food, over 70 are pollinated by bees,’ he added. 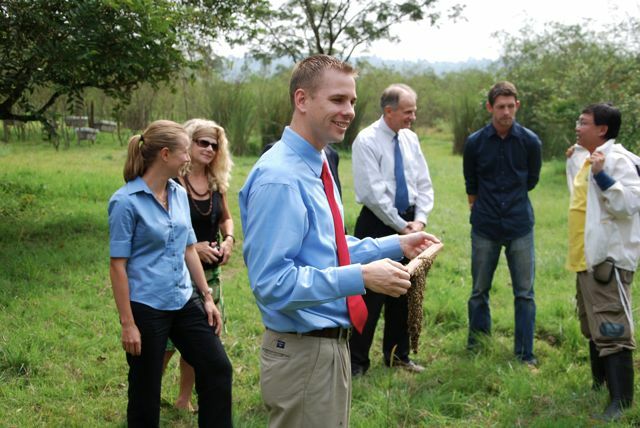 During the last training, we had the honour to have the US Ambassador to Uganda, Mr Jerry Lanier, his wife and several staffs from the US Embassy visiting us. 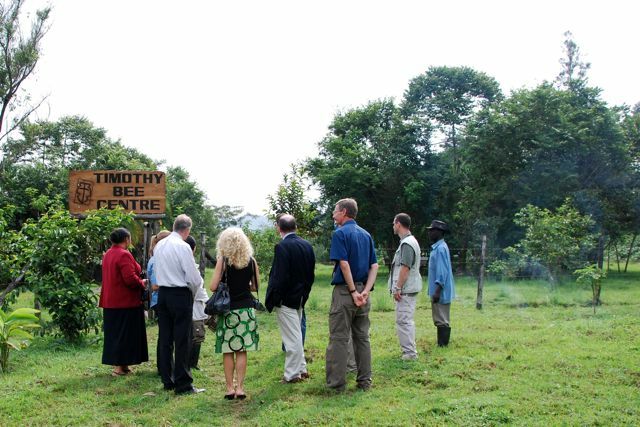 Timothy Centre acquired a grant from US Embassy and they were doing a tour to visit projects. 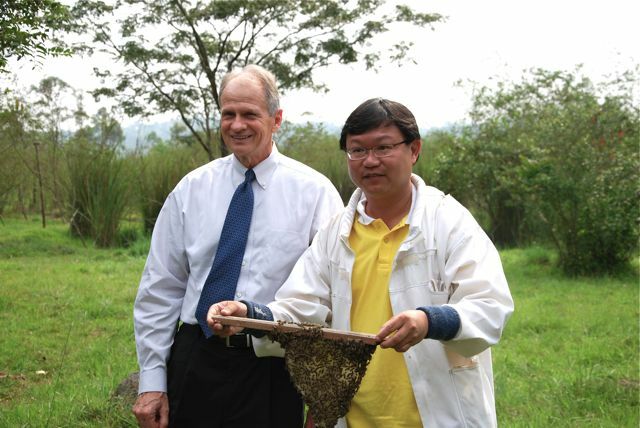 We invited the Ambassador and the team to get up close and personal with african bees. It will be their first time ever. They took the challenge. A short brief to prepare everyone what to expect before entering the apiary. Rare sight for all of them. Up close and personal with the aggressive african honey bees for the US Embassy staffs. Beeswax is one of the by-product from honey farming. Many bee farmers are not aware that it can be another income generating activity if they were taught to process and value add. 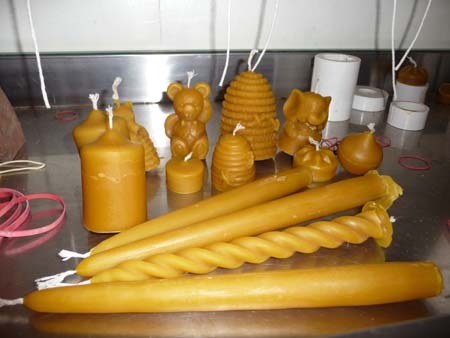 One of the main items that can be produced from beeswax are candles. 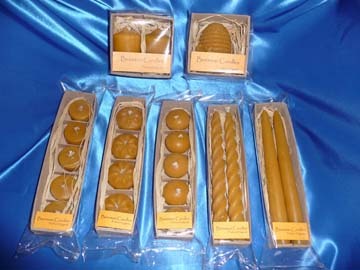 Beeswax candles are well received because of its natural origin. They are not chemically treated like paraffin candles. 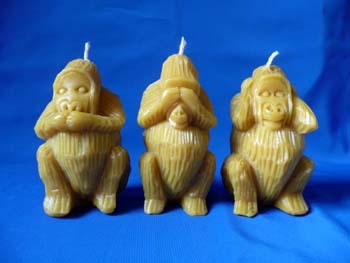 In fact burning beeswax candles are more environmentally friendly as one does not inhale toxic fumes in comparison to burning paraffin candles. The advantages out weigh the normal paraffin ones. One of our programs at BEST is to empower the farmers to utilize what is available in honey farming and to teach them about value adding. By collecting empty combs from the hives, they were taught how to convert honey combs to beeswax using whatever they can find locally. Simple understanding of how things are done do not require expensive equipments. Take for example, a simple solar wax melter are just a few pieces of wood nailed together. Having it painted black to increase the heat absorption rate. Inside are just a few stones to harness the heat , a simple pot cover, with holes drilled acting as a sieve. 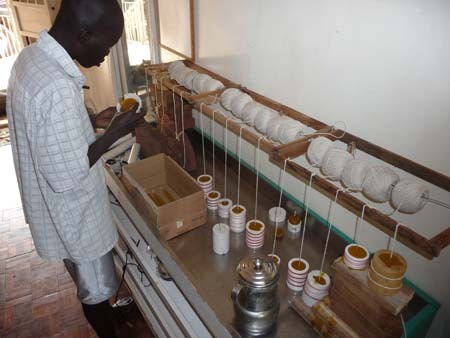 Under the harsh African sun, the combs will melt through the sieve in a sauce pan, giving them the raw beeswax. A simple method of turning combs into beeswax. 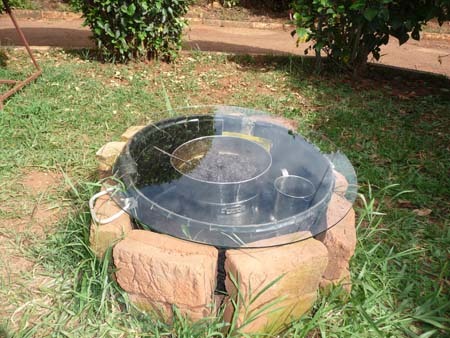 Here is a smaller and simpler version of the solar wax melter. Once the conversion is done from combs to wax, the rest is getting it moulded into different shapes and sizes ready for market. As part of the training program entails entrepreneurship, for those farmers that do not have the facilities to start their own production, we get them involve in the candle making process so that on top of producing honey, they can come to the centre with their beeswax, sell them to us and gradually teach them to use their income to start their own small business. we will help them to acquire moulds from overseas where they have no access to the products. Candles before going on to the next stage, packaging for market. We got acquainted with some Philanthropists from Singapore and we are in the midst of a discussion of bringing our bee education centre project to a development in Malaysia called, “Kampung Temasek“. “The core purpose of Kampung Temasek is to do what cannot and is not done in Singapore by way of educating our parents and kids about nature, the kampong spirit and the reconstitution of our innate Singaporean enterprise-spirit which no longer available in urban Singapore. What was gained and what was lost? We gained values and skills for industrialisation, white collar jobs and systematic administration. But our loss was creativity, initiatives, imagination, the enterprise spirit and empathy with nature, community and etc. 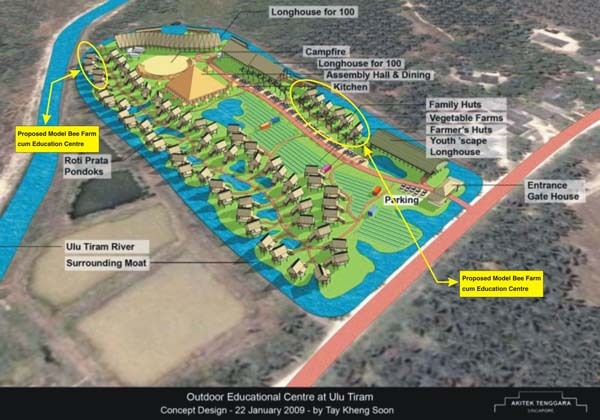 This Kampung Temasek project is primarily an educational program for the entire family because it enables them to reawaken lost values, attitudes and skills. Starting with confidence building through adventuring and bodily coordination, the enterprise spirit will be exposed to nature and the surrounding communities to better grasp the natural and social ecosystems which sustain all life forms. These knowledge and abilities are challenged through projects which require creativity of the individual and the family. Special trainers and enablers will be on hand to facilitate the learning process to make it tremendously enjoyable and enlightening. To free the hearts and minds of people to new challenges, unfamiliar situations and new opportunities the 21st century will throw at us since every job, vocation and interest will change. Striving to provide an experiential enterprising education for the whole family, Kampung Temasek welcomes all enterprising spirits interested in rediscovering the missing ingredient for successful living”. We find Kampung Temasek very much in line with our BEST program and hopefully by end of 2011, we would have developed a small education centre for the public and at the same time develop a beekeeping industry for the village community around so that it will be another source of income. Below is the proposed plan for the development of the Bee Centre. The final location has not been decided yet. Please visit Kampung Temasek website for a more detailed insight. Village folk without social responsibility……………………. This is one issue we beekeepers have to face, the irresponsibility of farmers around the apiary. During dry season, some of the villagers will take this opportunity to start a fire in order to collect firewood (charcoal) after the forest had burnt out. They don’t care whose land it belongs to. Yesterday afternoon, our land not far from the apiary was set aflame. 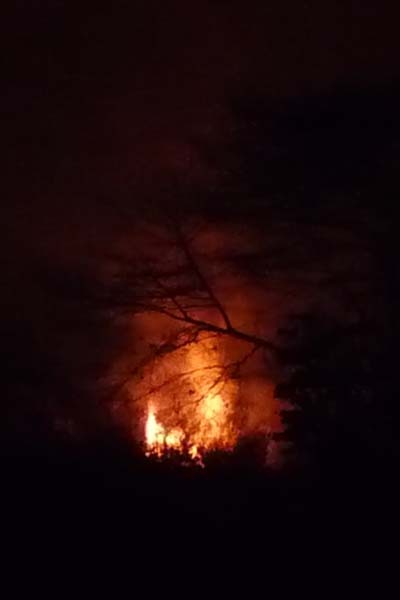 Due to the dryness of the trees around, the fire spread quickly and by 6pm, it had moved towards the apiary and Timothy Centre’s guesthouse. We can’t do much but pray that the wind would change direction and move the fire away from the apiary. The security guards did a fine job by containing the fire. Eventually the fire subsided before midnight and I thought the cool air would not get the glowing flame light up again. At 2am, I heard crackling sound and I went out to take a look. The fire had started once more. Luckily this time round the fire was not near although it was big. I did not capture the earlier fire because my camera was not with me. Below picture was taken at 2am. The flame was about 10 meters tall. BEST Program on 30/08/10 to 04/09/10……………………. Simon Peter – The training has been fantastic. I had learnt a lot from the apiary. Before I came for the workshop, I had it in mind that bees were the greatest enemies of human being in life, but after I came to learn that once when you attend to them carefully and tenderly, they can give you whatever you want from them. They can know that you are their master and cannot be aggressive to you. I have learnt how to make money from bees and how to sustain myself by getting money from bee-products like honey, beeswax. I am now very much conversant with making bee hives and this will help me to make money from it. This is all I have learnt from this workshop. Thanks Timothy Centre and thanks Lesster and Karl. Doreen Semucho – This training has improved our understanding on how to handle bees so carefully for the better harvest of honey. We have also learnt other uses of bees like pollination. 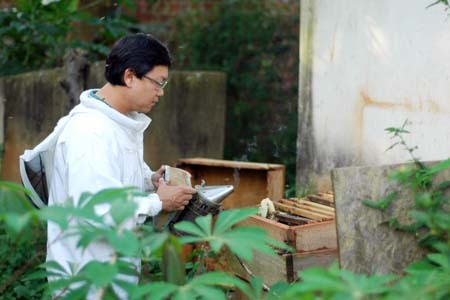 The training has been practical which has enriched the trainees interest on how to keep bees as an economic activity. We’ve really learnt so many other things and we are committed to put this to practice and to teach our community the goodness of protecting and keeping bees. When there are bees, there will be honey……………………. Yesterday I received an email from a trading Company in Singapore telling me that they are interested to carry our honey products to be marketed back in my homeland. I guessed they could had gotten my contact either from the web or had read an article somewhere regarding my work as a honey farmer here. If it was my former self, I would had taken it personally. How can she ask me all these questions without first doing her homework on the industry. She had not even understood what a beekeeper had to go through in order to have that clean jar of honey on the table. I was very surprised with myself that not only was I not offended with these questions thrown at me, and instead replied her with an earnest answer. There are no rights or wrongs with consumers asking that kind of questions. Its just because there are not enough information for the consumers to understand about this industry, especially honey farming in a third world country. I had to thank Violet Oon for that. Violet shared her experiences as a professional in her work, dealing with all kinds of people from all walks of life. While we were discussing about how we are going to present Uganda honey back to Singapore, we touched on the competitiveness of our honey in comparison with the honey from other countries. My main concern was that Uganda has no regular shipment or flight back to Singapore and the cost of transportation will be an issue. What struck me was when she enlightened me on the different consumers’ needs and want. I began to empathize with the way the lady approached me with her questions. There are products that are meant for general public and there are products that only meant for those who knows and appreciate the values. Its not the end product but what kind of social impact the product had benefited the community during the course of development. I should be the one having to recognize which market is best suitable for my product. Once I can place the path correctly, I will get my direction right. Coming back to the process of harvesting honey, the many challenges that the farmers had to face had never crossed the mind of the people around the table when that small teaspoon of honey was lifted off the jar. Two of the toughest but deadly challenges faced by the farmers are mentioned below. Personally I had encountered some of the snakes during my life as a bee farmer here. With GOD’s blessing and guidance, that is our only protection from grenades or land mines. 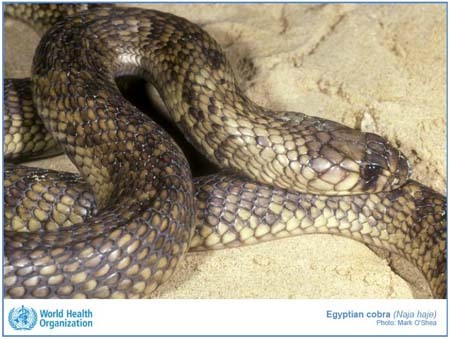 You can find more informations and pictures regarding snakes here. 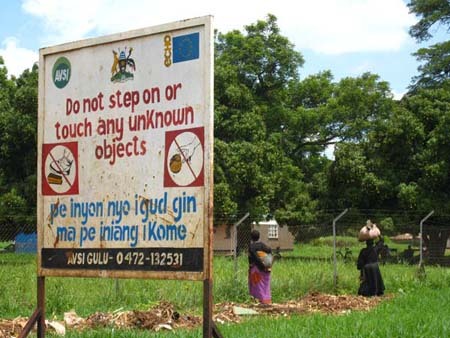 THE HIGH RISKS OF HONEY FARMING IN NORTHERN UGANDA. 1) For the last 22 years, Northern Uganda had been under insurgency by the Lord Resistance Army (LRA). Although the fight had ceased and they had left for Central Africa, there are still a lot of unexploded grenades and land mines lying around. To date, United Nation are still deploying mines experts to detect and detonate land mines. Villagers, especially children were still killed by these mine till today. 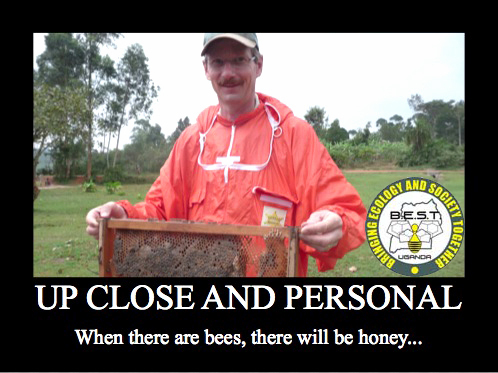 Our bee farmers are like playing “Russian Roulette”. They will never know when they would step on one. Warning signs were erected at many locations to remind villagers of the danger. 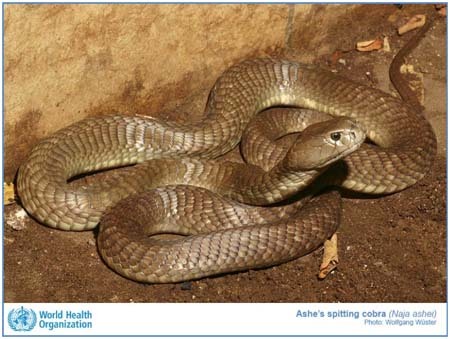 2) Venomous snakes occur throughout many regions in Uganda and are a threat to the people in the agriculture industry, especially in the rural areas where they are most abundant. 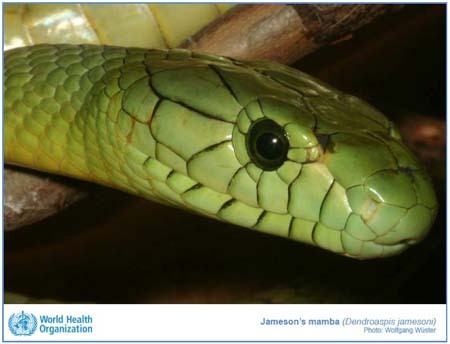 Out of more than 3000 species of snakes in the world, some 600 are venomous and over 200 are considered to be medically important. 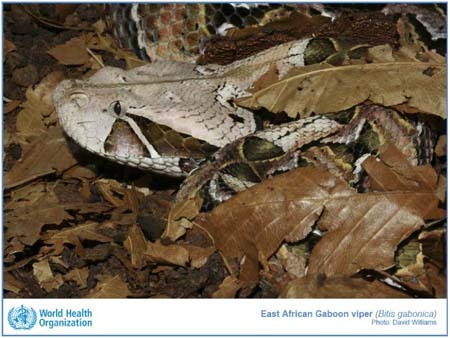 There are two types of categories in venomous snakes. Uganda have 13 species. 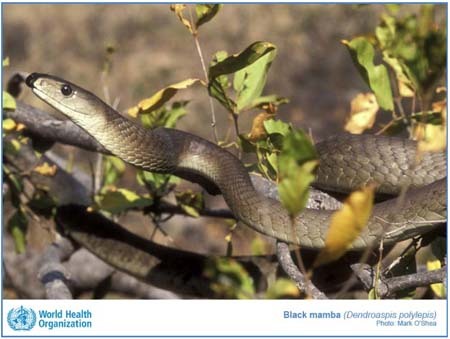 Definition: Highly venomous snakes that are common or widespread and cause numerous snakebites, resulting in high levels of morbidity, disability or mortality. 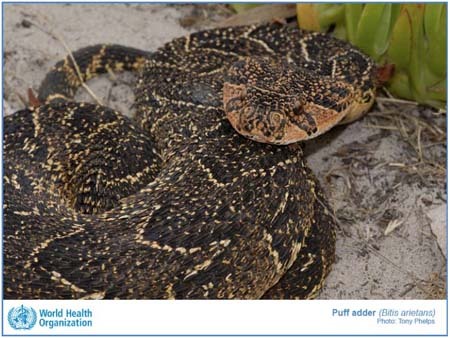 Definition: Highly venomous snakes capable of causing morbidity, disability or death, for which exact epidemiological or clinical data may be lacking; and/or are less frequently implicated (due to their activity cycles, behavior, habitat preferences or occurrence in areas remote to large human populations). 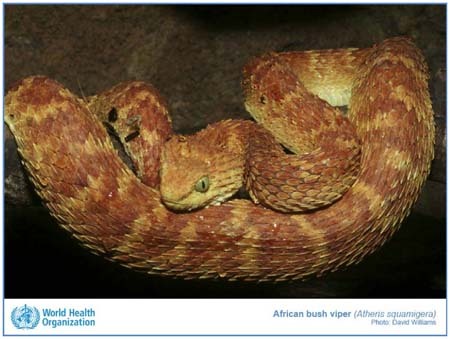 Africa has the highest number of venomous snake found. Uganda is no exception. 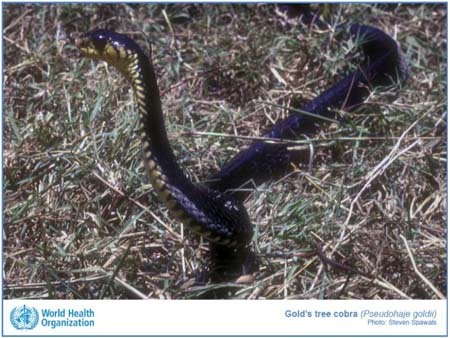 Below are the types of snakes that can be found in Uganda and the chances of the bee farmers facing them during harvesting is high. 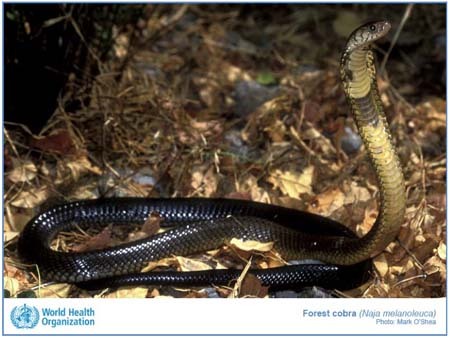 Bee hives have a warm temperature of 35ºC and snakes love to hide inside the bee hives during raining or cold nights. 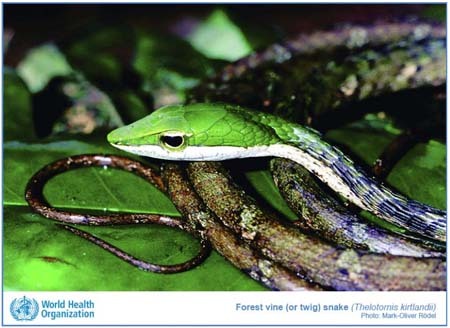 Forest vine (or twig) snake. To the lady who wanted to import the honey, it’s just a matter of a day’s work, but to the farmers who wanted to sell their honey so that they can provide for their family, it’s a matter of life and death. 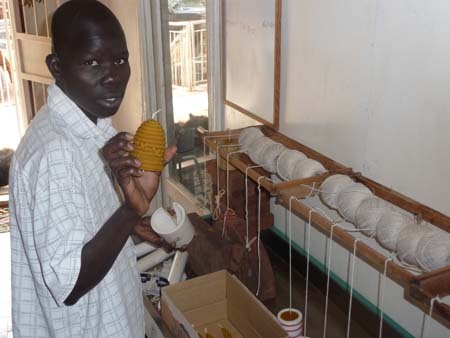 Bee farmers is Bushenyi, Western Uganda. 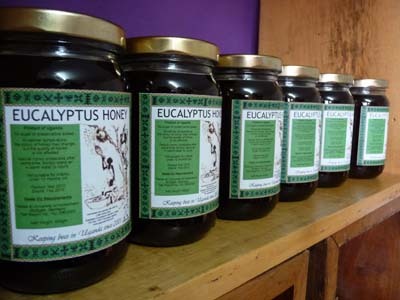 Introducing Eucalyptus Honey at our boutique……………………. Finally the test report is out and we are able to introduce a new range for our boutique, Eucalyptus honey. In our Mellisopalynology report, pollen count shows 95.8% belonging to the Myrtaceae family. Less than 3% consist of Mango, Combretaceae, Anacardiaceae, Senecio-group and Musa. 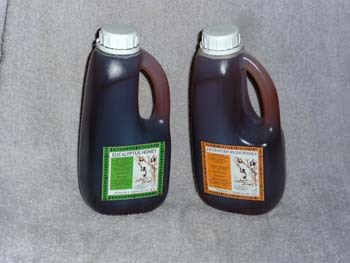 Our Eucalyptus honey is thus considered Monofloral. The enzymes (Diastase) activities detected was found to be much higher than the recommended EU Honey Legislation in Europe. This shows that the honey was filtered raw and natural and has never been heat treated or had gone through UV lights or any forms of heat energy such as microwaves. Diastase, this enzyme is responsible for converting starch to dextrins and sugars and is introduced into the honey by the bees. The moisture contents of our Eucalyptus Honey falls below 20% and this is one of the most important aspect when buying honey. According to the EU honey standards, honey having more than 20% in moisture content determines the rate of fermentation. Unripe honey harvested are usually having a moisture content of 23% or more. It will taste sourish. Our Eucalyptus Honey is dark amber and has an intense and persistent peppermint after taste. It crystallizes much faster are usually preferred as an excellent accompaniment to cheeses, pastries and herbal teas. 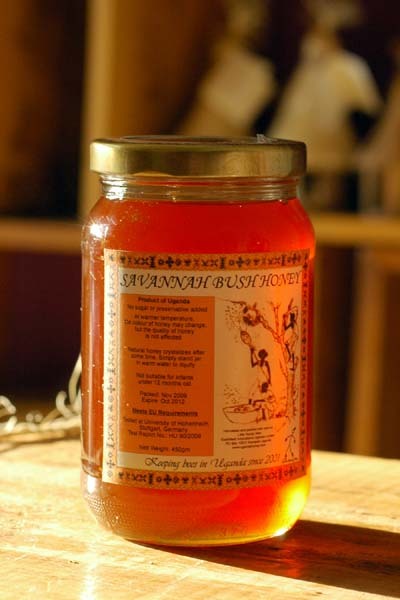 In Uganda, villagers are often seen using Eucalyptus Honey as a home remedy for mild cough and cold. 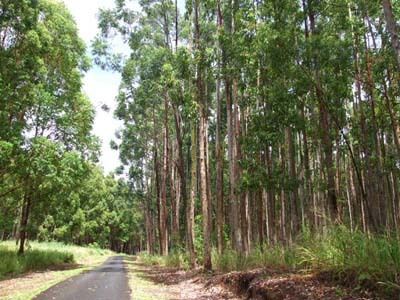 Eucalyptus Grandis or E. Grandis is well known in Uganda, being first introduced around 1912. It is commonly planted for fuelwood and poles and is an important source of income for small farmers. As other sources dwindle, E. Grandis is increasingly being recognised as a valuable source of timber too. It is easy to raise from seed and coppices vigorously when cut. Many of the E. Grandis trees in Uganda have hybridised, however, and thus it is important to use only improved seed from tree breeding programmes (mainly in Southern Africa) for commercial plantations here. 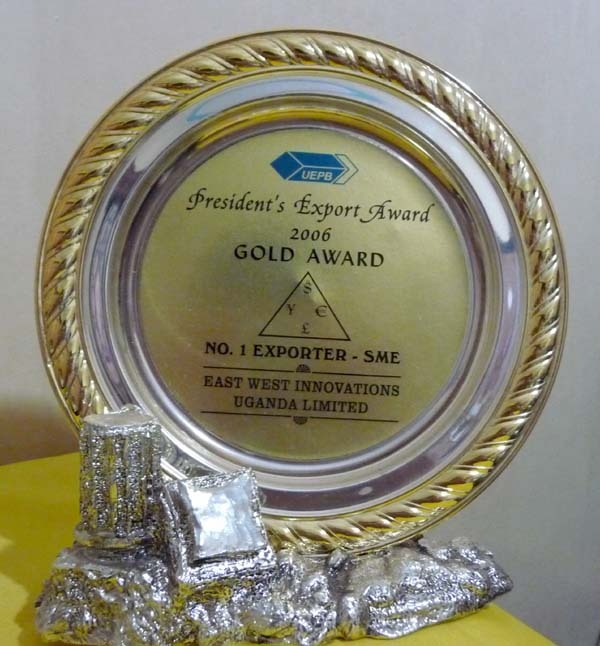 In Uganda, E. Grandis is best suited to deep soils in the cooler, moist areas – particularly in the west – around Kabarole and Bushenyi, in the West Nile region and in the south-west (Kabale). On suitable sites and with good management, E. Grandis can grow extremely quickly: Mean Annual Increments of over 50 m3/ha/yr can be achieved in such areas, though an average of 25-35 m3/ha/yr is more likely. Rotations of 8-15 years are expected for the production of sawlogs and large poles. One small harvest before heading home……………………. Fresh comb honey harvested the night before. I am excited to make my trip back home tomorrow. I guess you can say it’s occupational hazard. I must visit at least a colony before I leave. Meanwhile, I harvested some comb honey to be brought back to Singapore for my family members and friends to see what is ‘REAL RAW HONEY”. There are so many marketing hypes about raw honey and its health benefits in the market but actually, does one really knows what does that mean or are they simply buying the label? Well hopefully this time round my family and friends are able to gain more insight of what is real raw honey harvested fresh from the farm. 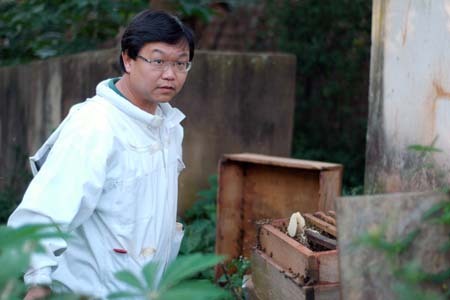 Yes, although I am keen to push my honey into the Asia market after having served the European market for the last 5 years, I would also like my consumer friends to fully understand the benefit of eating honey, and not turning it into some kind of miracle wonder medicine that can cure everything. If I were to do that, I am doing a disservice to my fellow Singaporeans. Hopefully this small talk will enable more to appreciate the existence of the honey bees and how it contribute to mankind. At least you will know that the next spoonful of honey you take, no bees were sacrificed. 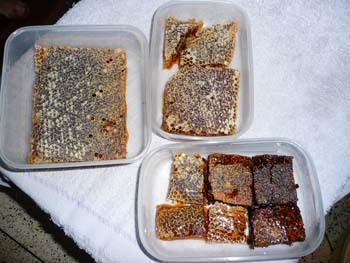 Honey combs prepared in chunks. Two floral in production - Eucalyptus and Savannah Bush Honey. Really appreciate Jonathan for taking time to come from Singapore to capture moments of my work in still life. He had also shared a lot on the art of photography. Its all about inspiration and being able to capture the feeling and moment there and then. The final challenge is to capture the African bees closeup at 5pm. 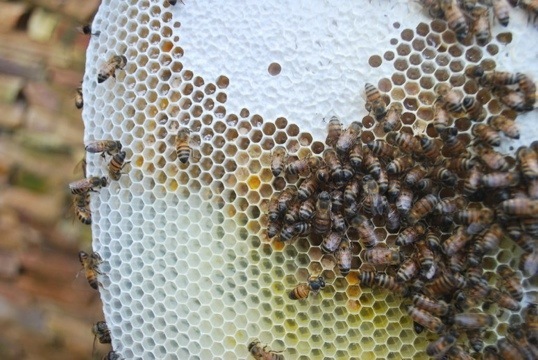 The timing for opening up beehives during the day is crucial. The weather must be cool in order for the bees to stay calm. Come next week, when Jonathan leaves for Singapore, we will resume the transfer of bee from Kampala to Timothy Centre at Masaka. Sending a little bit of smoke signal telling the bees we are coming in peace. Waiting for the bees to calm down before signalling Jonathan to come forward for the shoot. First time for Jonathan to come so close to a colony of African bees. Another magical moment for Jonathan's profile. Up close and personal. Mobile phone towers threaten honey bees: study……………………. NEW DELHI (AFP) – – The electromagnetic waves emitted by mobile phone towers and cellphones can pose a threat to honey bees, a study published in India has concluded. An experiment conducted in the southern state of Kerala found that a sudden fall in the bee population was caused by towers installed across the state by cellphone companies to increase their network. The electromagnetic waves emitted by the towers crippled the “navigational skills” of the worker bees that go out to collect nectar from flowers to sustain bee colonies, said Dr. Sainuddin Pattazhy, who conducted the study, the Press Trust of India news agency reported. He found that when a cell phone was kept near a beehive, the worker bees were unable to return, leaving the hives with only the queens and eggs and resulting in the collapse of the colony within ten days. Over 100,000 people in Kerala are engaged in apiculture and the dwindling worker bee population poses a threat to their livelihood. 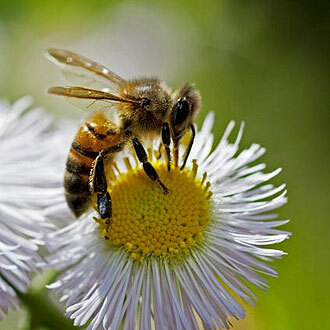 The bees also play a vital role in pollinating flowers to sustain vegetation. If towers and mobile phones further increase, honey bees might be wiped out in 10 years, Pattazhy said. Read an article the other day regarding the problem with “Colony Collapse Disorder” where the honeybees simply vanished from the surface of the Earth. Scientists had came out wth some findings. It has to do with the way modern honey farming are done. 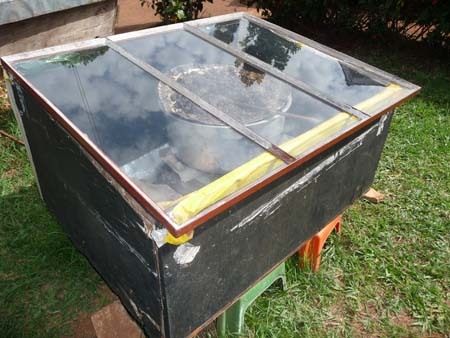 Modern honey farming recycle the honeycombs. Now the scientist found traces of pesticides residue that were remained in the combs. This is a very interesting point to look at. Slowly bee farmers around the World are taking effort to understand traditional way of beekeeping. Went to open my letter box yesterday. The test report had arrived! 🙂 This evening I gave a call to Professor to thank him. We had a long talk about the report and the honey we had harvested. There are so many things one will never believe what we can find from this tests. Many people only knew about honey from salespeople telling them how good the honey is or whether your grandfather or grandmother used to take them. Too much of marketing hypes. If you really ask the salesperson what actually is inside the honey, they will never know. I recalled sometime back in Singapore, when I asked one of the salesperson whether the honey was harvested riped or unriped, she gave me that queer look. 😛 She simply brushed me off telling me that the honey are pure honey and my grandfather used to take them???? I was wondering how did she ever knew my grandfather? I didn’t even knew him. As much as one knows about internet and googles, one can find tons and tons of general and common information about honey, cut and paste from one website to another. Having said that, you can find at supermarket, salespeople trying to sell their product as if theirs is the ultimate honey and a miracle wonder compared to the rest of the honey from other honey suppliers. Little did one realised that most of the honey are coming from the same source. Same product, different packaging. 1) Is the honey pastuerised? Once honey is heated, all the nutritional properties are damaged, enzymes are destroyed. 2) Is the honey collected from bees that are treated with anti-biotics? 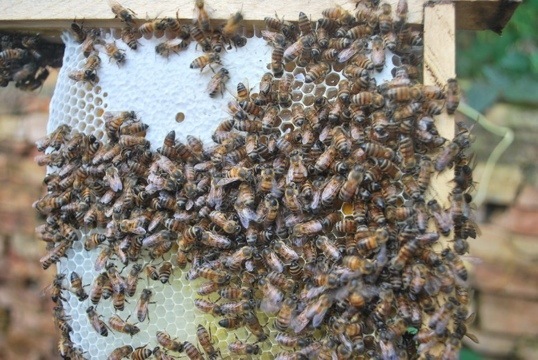 Most of the commercial bee farm, the bees are infected with some form of viruses. 3) What are the percentage of anti-biotic contamination? Is it within the safe level. There are cases where the anti-biotics are spilled over into the honey. 4) How does one define pure honey/Organic honey/natural honey/raw honey? What are the difference? Many a times, I find honey branded “Organic” but do not have any Organic certifications. 5) What is riped and unriped honey? Good quality honey are honey that are ripe and has a moisture content of less than 20%. 6) How can one harvest so much wild “riped” honey from one country and sold at the supermarket in tons? Wild honey are usually honey harvested from a species of honeybees called, “Apis Dorsata”. They are also known as “The Himalayans bees” or “The Giant Honeybees”. 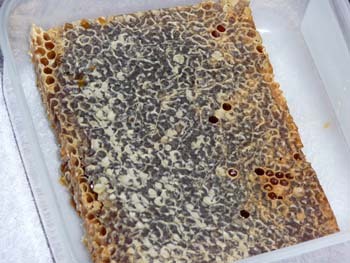 They are normad bees and only colonised on one hugh honey comb, unlike the “Apis Meliferra” honey bees. “Apis Dorsata” will “eat” the honey back before they are ripen before they travel to another destination. 7) If one is selling “Wild Honey”, are they “Honey Hunting”? Are they killing the bees in order to acquire the honey? “Wild honey” are seldom ripe. Unripe honey has a higher moisture content and are usually sourish in taste. Fermentation takes place at a much faster rate. Usually you are advised to consume the honey within a short period of time. Ripe honey will not ferment and has no shelf-life. 8 ) What sort of floral are they honey derived from? Different floral has different character in taste and colour. It must coincide to confirm the country of origin. 9) Tracebility? Do you know exactly where your honey is coming from? Or the honey has been mixed from all over the world. 7 weeks of concrete jungle and now I am back to true blue nature! 🙂 Going into the second year working with the bee farmers in Gulu. While traveling up to meet them, I had to stop to take this breath taking view, a beautiful tree with her branches spreading over a radius of nearly twenty metres. I just stood there and admired the tree. Thinking out loud, how this tree had seen twenty two years of insurgency and I believed she also felt the pain and suffering the villagers had gone thru. Now that Gulu is at peace once more, when I looked at this tree, it does gives me a sense of serenity, peace and tranquility. Honey flow season had begun and we are preparing for the first harvest for the year. Odong, one of my beemaster and I went round a few villages last week to meet up with the bee farmers and refreshing them with some pointers on getting better quality honey thru proper handling of the bees and honey. Getting ready for harvesting. Final briefing from beemaster. 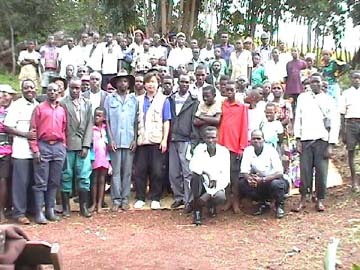 Farmers group at one of the apiary at Paicho district. 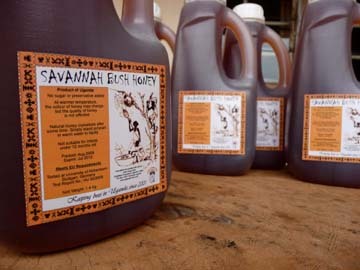 Inefficiencies in honey supply chain, low capacity of producers to understand and negotiate markets, have continued to deny Uganda the opportunity to achieve its full potential in bringing income benefits to the poor. Currently Uganda produces 3, 000 tonnes only but it has a capacity to produce over 200,000 tonnes if all issues are put together. 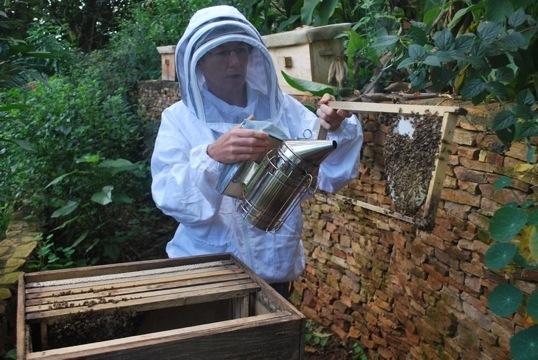 Local hives have proved to be profitable than frame hive beekeeping and overlooking this fact has the opposite effect to the development of apiculture sector in Uganda. 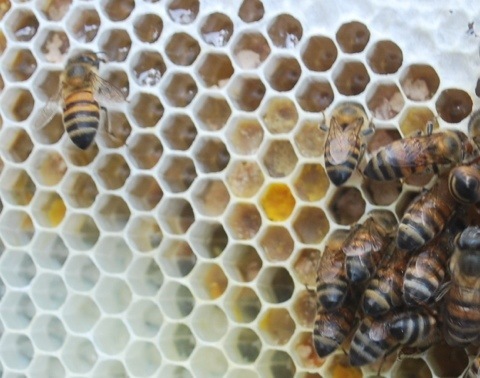 “Commercialisation therefore is about being efficient cost –effective and raising income to alleviate poverty to many and has nothing to do with hive types. 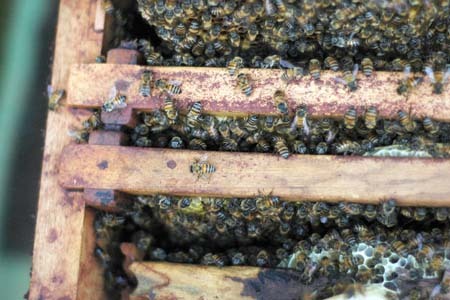 Therefore it is necessary to focus training on honey harvesting and handling rather than trying to transform beekeepers from using the local hives to frame-hive beekeepers,” the report said. 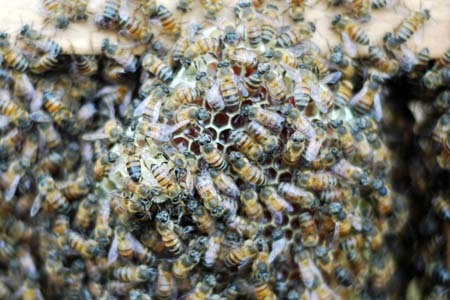 The issues illustrated in the article was discussed previsouly in the entry Defining sustainable beekeeping. When paths cross, life can change……………………. Last Sunday I felt so honoured to have been invited to lunch with Burkhard and family. My aquaintance with his brother Volker went way back in 2007 when he contacted me to help Kids of Africa, an orphanage in Uganda to set up a few bee hives at the farm. Their vision and plans for these orphans had made me open up my eyes and heart and to know that these kids are not alone. Burkard and Volker did not just simply end their task by giving these children a home. They have even developed a long term journey for them to be independant when they have reach working life. Not only did they help these children to pursue their dreams academically, they have also catered for those who are more technically inclined. Within the compound, development process is already underway for a carpentry workshops, agriculture knowledge, animal husbandry and even an apiary where they can learn something that is close to their nature and culture. This way, these children will have an easier time to intergrate back into the society. They have indeed changed my life too! I thank you.